Dana Air has launched a Mega Miles promo which encourages its guests to book a return ticket and get miles good enough to get an upgrade from economy class to business class at no cost or pay for excess luggage using miles. According to statement by the airline’s Media and Communications Manager, Kingsley Ezenwa, the offer is only for Dana miles members and the promo will run from 1st of February to 31st of March 2019. The promo entails guests to book return tickets on same reference within the period, quote their membership numbers when booking for miles to be credited within 24 hours. Dana Air recently bagged an award from an Akwa Ibom based group for its efficient service delivery, timely departures and for operating in accordance with global best practices. 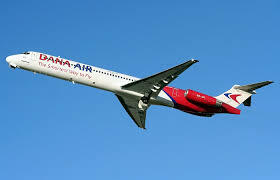 The airline is one of Nigeria’s leading airlines with daily flights from Lagos to Abuja, Port Harcourt, Uyo and Owerri.